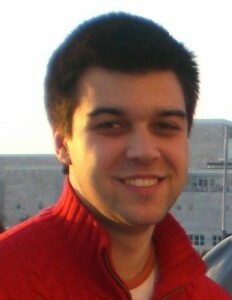 Diogo Miguel Caetano has undergraduate degrees (bachelor and master) in Electrical and Computer Engineering from Instituto Superior Técnico of the University of Lisbon. His PDFCT AIM project is entitled Integrated Circuits for Driving and Precise Reading of Integrated Resistive Sensors”. This project takes place at INESC-ID and INESC-MN. The thesis is supervised by Professor Jorge Fernandes (INESC-ID and Department of Electronics of Técnico) and co-supervised by Professor Susana Freitas (INESC-MN and Department of Physics of Técnico). His doctoral program started on September 1st, 2016. Diogo. M. Caetano, M. Piedade, J. Graça, J. Fernandes, L. Rosado and T. Costa, “Live demonstration: A CMOS ASIC for precise reading of a Magnetoresistive sensor array for NDT,” Proceeding on the IEEE International Symposium on Circuits and Systems (ISCAS), Lisbon, 2015, pp. 1906-1906.